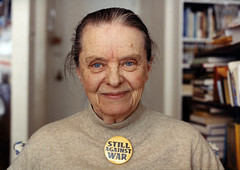 Congratulations to poet Marie Ponsot, who was just announced as the 2013 winner of the prestigious Ruth Lilly Prize. The prize, established by the heir to the Lilly pharmaceutical fortune, honors a living American poet for lifetime achievement. At $100,000, the prize is about the heftiest a writer can receive. I’m delighted. 91-year old Ponsot is a national treasure, both as a poet and as a human being. I’m also feeling a wee smug. Just last week I posted a Marie Ponsot poem, and there I complained that the Poetry Foundation had given her short shrift in her biography, a mere paragraph. Other, lesser poets to my mind, have much, much more space allotted on their Poetry Foundation page. So today, along with the announcement of the prize, which it awards, the Poetry Foundation presented a more suitable biography for Ponsot. You can read my post on Ponsot here. I also left one of her poems on the beach last November. You can see the picture of her poem “Oceans” here. A Jesuit pope and now this. It’s been a good week.